Vidhi and Rushang wed in Jaipur, and their celebrations were all about fun and bonding, beautiful decor and buzzing functions. 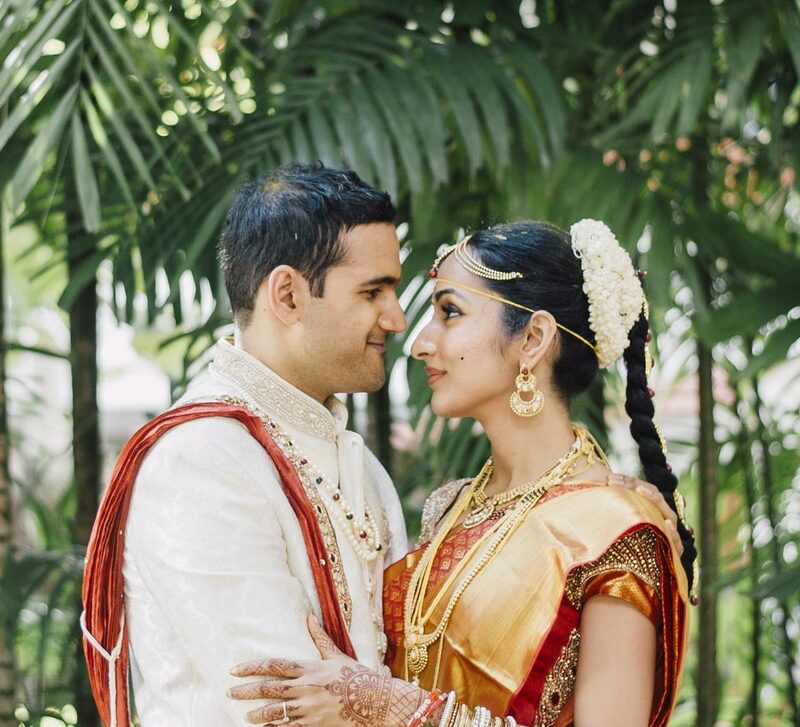 Vidhi and Rushang may have taken seven years to realize that they were each other's soulmates, but once that was was clear, they didn't waste time in taking the seven pheras around the holy fire. 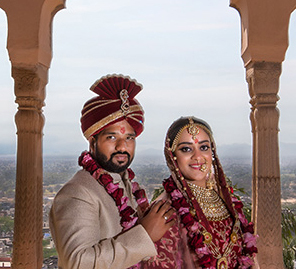 The bride shares the highlights of the wedding and the beautiful pictures clicked by WeddingSutra Favorite Naman Verma Photography below. "Rushang and I have known each other for seven years. We were in the same class in college and soon started traveling back together from there to home since we also happened to live close to each other. Eventually, we became really close friends but we never saw each other in a romantic light. After a while, we started to connect and things started to grow between us. By this time we had known each other for two years and knew just about everything in each other’s lives. All our friends kept telling us that we would be perfect together but it was only when his family started pressurizing him to start looking at girls in case he wasn’t already seeing someone, when I realized what he meant to me – I couldn’t imagine him with someone else and he later he told me, he had felt the same way about me! Thus began our dating period. Soon we told our family about our situation, and they were very accepting of our choices." "Rushang proposed to me in a very private setting. He had called me to Olive Bar & Kitchen for dinner. I was dressed very casually as I was expecting it to be a regular evening together. When I reached there, I saw a small area had that been decorated, a guitarist, a bottle of champagne and Rushang in a tuxedo! That very moment I knew what was happening. I was so surprised! I loved everything about it." 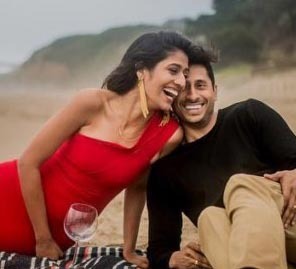 "We live in Mumbai and were hosting a wedding in July, so there was no way we were getting married in the city that we stay in. The erratic weather would have been a lot to handle for our guests and us. Goa had great properties, but the rain would have been even more of an issue there. While we were searching for other options, a relative suggested the JW Marriott Jaipur Resort & Spa. They said that it was a new resort, so we decided to check it out. We went there in October and fell in love with everything about it. It is such a beautiful place. The rooms are spacious, there are wonderful paintings everywhere inside the property, the ballroom is gorgeous, and the water bodies are all clean. In terms of hospitality, the team at the hotel impressed us with their energy. They were polite and punctual. All our functions took place on time. They were also very cooperative with our decorator. The only thing that they don’t permit is the use of flowers that bleed color which is very understandable because the property is painted white. But besides that, they were okay with us doing our thing and didn’t create any hassle for us." "My in-laws love planning weddings, so when we decided to wed, they got into action mode immediately and took care of the planning all by themselves. To take care of execution and management, we hired P5 Events. We have friends in Jaipur who have trusted them with their services in the past and had been very happy with their work, so we went with their recommendations. Our wedding decorator was Abhinav Bhagat and he was phenomenal with everything he did. He made sure that he complied with the hotel’s regulations and made use of the permitted fresh flowers and fruits! He incorporated some pretty prints and lots of pastel colors in the decor for various functions and the results were fabulous." "Naman Verma and his team took charge behind the lens. On the days of the wedding celebrations, it felt like he was my best friend. Despite the busy schedule, he made sure he got my solos in all my outfits. On the last day, he and his team prepared a same-day edit video for us that we screened at the reception. They even included shots of the wedding that had happened only two hours before the showcase. Everyone went crazy about the video!" "A day before the celebrations, we hosted a high tea for our close friends and family. It was an intimate and casual affair, and we served a small banquet. I enjoyed getting my bridal mehndi applied and wore a Ritu Kumar tunic for this function." "The decor at this intimate event consisted of pretty tablecloths with small prints on them over which we placed floral centerpieces and candles. We had a band and a flute player at the event who put up a great show for our loved ones. Since this was a very relaxed night, we had a lot of our family who sang, I too sang for Rushang. We had a lot of dancing, and after the dinner, Rushang, and I hung out with our friends. I wore a Jayanti Reddy dhoti and cape while Rushang wore an outfit by Vimal Parikh." "Our haldi took place by the pool and the decor was just fantastic. Abhinav Bhagat gave this event a Rajasthani flavor by hanging lots of bandhani tassels around the venue and making use of printed fabrics for tents. The roundtables were covered with leheriya print fabrics, and large ethnic looking umbrellas provided shade. The decor hues of red and orange brightened up the environs. Rushang's cousins went nuts during this function. Once the ceremony was over, they took the water from the pool and threw it on us, as well as flowers. Everyone was dancing and just having a blast. For this event, I wore an ivory and golden lehenga that I bought from Eshah, which is a boutique run by a friend of mine. I paired that with a shirt blouse. The best part about this look was the gota jewellery that I wore. That was bought by Abhinav, and it was truly incredible! He also got pieces for my mother and mother-in-law. Rushang once again wore a creation by Vimal Parikh." "Our mehndi had a 'mela' (fair) feel with a Moroccan vibe. We went with a teal, white and peach color scheme. On the tables, we placed terrariums and small elephants as centerpieces. Abhinav placed a large swing decorated with flowers, flanked by two large elephants at the venues. The rest of the seating was a mix of wooden benches and low seats. At the entrance, he put carts with plant saplings and wooden 'RV' cutouts which turned out to be a great photo opportunity spot. He also put up tents that offered rifle shooting and sugarcane juice. We had about three singers who went around the venue singing and making people dance with them. We even had a 'ghoomar' (traditional Rajasthan dance) performance by 25 women from the family! A Anamika Khanna bustier and lehenga with a cape was my outfit of choice for this function, and Rushang wore an Anita Dongre ensemble." "For the sangeet, our decor consisted of fairy lights, white lilies and orchids and the function took place inside the ballroom of the hotel. We wanted to do something very unique so we decided we would begin with a ramp walk! We had a ramp walk instructor who taught all our family members how to sashay, and even my grandfather joined us on the stage. There was a ramp created an extension to the stage, and we had a blast pretending to be models. This was followed by dinner after which our family came forward with their performances. I wore a lehenga by from Jade while Rushang opted for an outfit by Shantanu & Nikhil. The night ended with an after party where we had DJ AJ managing the console. He was so good with this repertoire that our guests partied till about four in the morning!" "Next morning, at about 10:30 am, our pool party commenced. There were so many people inside the pool that at one point I could feel that the water temperature had risen! We had lots of games and DJ AJ and his assistant had everyone grooving. Everyone in our family loves dancing, so we had a lot of people shaking their legs. We had not expected this event to see so many people attending, and the main objective of the pool party was to give people something to do in the first half of the day. A lot of people had even said that too many guests would not show up since the sun would be up in the sky and those hours would be really hot. Fortunately for us, it was super cloudy and breezy! Our pool party decor was dominated by blue and white touches, and we made use of a lot of ombre tassels and white lamps as centerpieces. I had my outfit designed by Jay Makhija for this function while Rushang got his from Vimal Parikh." "Light pink and peach were the colors we used at our wedding. Abhinav placed large lotus structures near the mandap and created a small amphitheater-like seating for the guests. The attention to detail that went into the setup was phenomenal. He mixed Aztec prints with the Tree of Life motifs on the cushions. Lotuses were used to create the backdrop of the mandap, and on either side, he put up candle racks that made everything look magical. A moment that stood out to me at the wedding was when it sunk in that I was getting married and going to leave my parent’s home. I was walking down the aisle with my family, and my father just froze. That was when it hit him that I was going to go and I guess his reaction made us realize the same too. From that point, this function became a very emotional one for all of us. 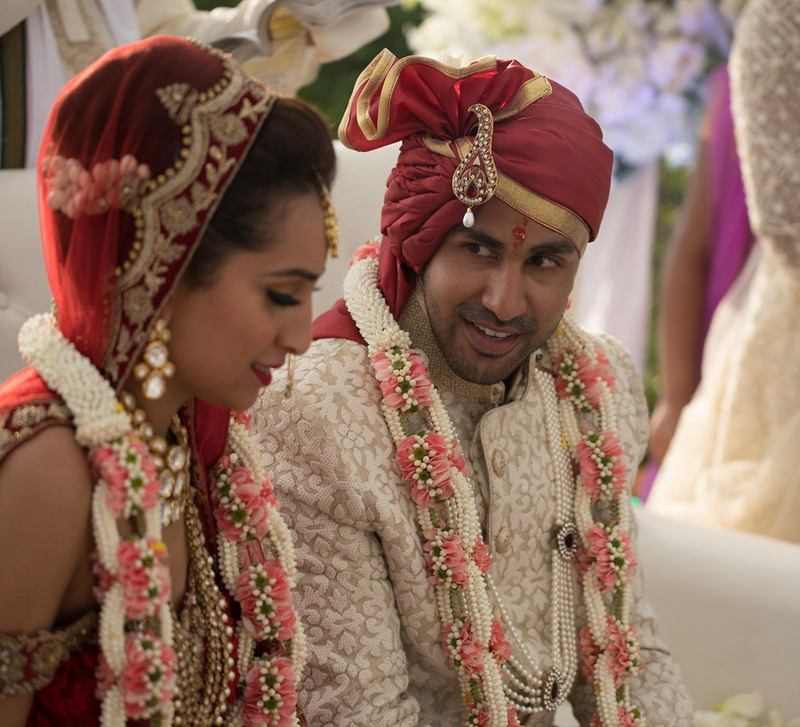 I wore a pink lehenga by Fabiana for the ceremony while Rushang opted for a sherwani from SVA by Sonam and Paras Modi." "For the reception, Rushang and I decided to go with western wear. I wore a gown by Jay Makhija, and Rushang chose a three-piece suite from SS HOMME. We were very keen on having the first dance and performed a mix of tango and waltz. We danced on 'Nashe Si Chadh Gayi' and 'This Piano Guys' version of a 'Sky Full of Stars.' All our guests were seated before the two of us as we made our appearance as a married couple for the first time. We made our way straight to the dance floor, and after our performance, we all headed for dinner. As for the setup, we had round tables for the guests a long head table that had a ceiling of fairy lights and florals that had been arranged to create a curtain. We also had a fabulous father-daughter duo play the flute and saxophone, and their talent was appreciated by all our guests." "Be careful while picking people who are going to be designing your bridal outfits. While I support upcoming designers, I opted for creations with established names for most of my functions because I just felt a little safer with them when it came to blindly trusting them with my trousseau. I also felt that it was easier to explain my vision to them which in turn reduced the stress and hassle. Couples should also try and stay away from stress, and the easiest way to do that is by not getting too involved in the planning process."